ARCHAEOLOGICAL DIG AT MARINA PARK: Several 30' x 3' trenches were dug (and now back-filled) in the parking lots by the Boat Launch in December 2010 to determine if there are artifacts from previous native and settler activity on this historic riverbank site which has seen a variety of human activity over the past centuries, and will be subject to park redevelopment within the next few years. 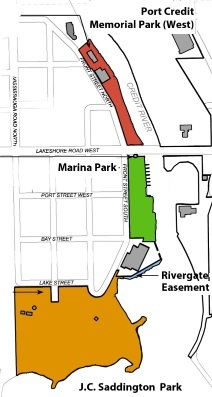 Click here to view the initial concept plan (9p PDF) for Marina Park, as contained in the Waterfront Parks Strategy approved by Council in March 2008. There is strong community support (and an economic rationale) for retaining the boat launch in this location in addition to new waterfront uses (e.g. floating boardwalk leading south around the 'Rivergate' apartment building to Saddington Park). 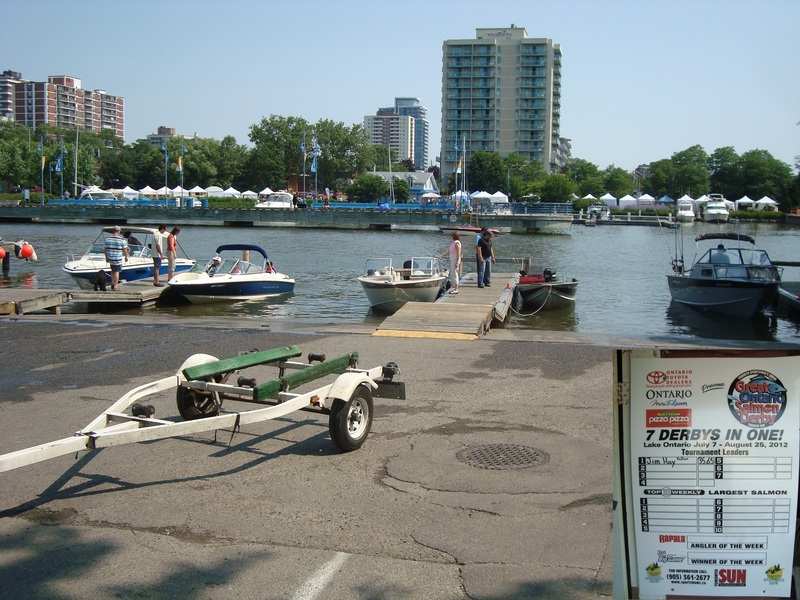 Statistics of boat launch usage have been tracked by the City and local advocates, and show Marina park receives extremely high usage in summer -- the number of visitors is equivalent to 7 tour buses a day! Further public consultation will be taking place in 2012 regarding the Boat Launch prior to any master planning for redevelopment of Marina Park. SALMON DERBY GOING STRONG: July 14, 2012. After the first week of the Derby, here is the number to beat: 35.65 lbs! The boat launch at Marina Park (map) is hopping. 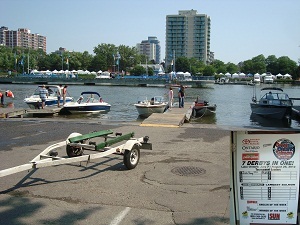 With its renowned fishery, Port Credit Harbour and its charter fishing fleet (largest on the Canadian side of Lake Ontario) is official home to the Derby, which is the largest fresh-water fishing derby in the world. ► Click image for enlargement (tents for the Art Show are across the Harbour).